I’m a big fan of simplicity. As a designer, I’m always looking for ways to strip away – and to get the cleanest, clearest message across in the most aesthetically pleasing way. So, I appreciate when I see this approach taken with other products / services. The folks at Cinch Financial (cinchfinancial.com) seem to be aiming for this with their combo, recommendation and “bill reducer” website. Founded by two financial gurus, Cinch Financial’s goal is to make it easy to get the right information about some of the biggest expenses we encounter on a daily basis: mortgages, credit cards, insurance and banking. Is the product available where you live? Are they easy to do business with? Do they consistently offer good deals? Are the products worth it? And, what’s the best one for you? Let’s just say you are looking for a bank. Cinch walks you through a one page, 8 question survey to determine your banking needs. It literally takes minutes and is uber easy. When I plugged in my information and location – the site didn’t return any banks in my area – but this could be related to Cinch still being relatively new to the game and are likely still building out their recommendations in every US region (in fact, I didn’t get any local recommendations for the other services in Minnesota). Even if you don’t get back personal results that may be relevant to your location/needs, Cinch offers their picks of the best “online” banks that have passed their 6-point vetting process. They also do this for credit cards, auto insurance and home insurance. 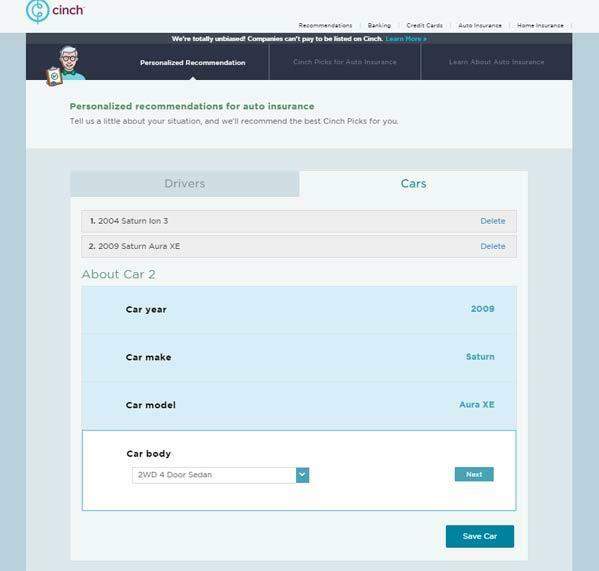 Here’s what’s most charming about Cinch: they don’t receive any compensation for recommending a particular product – unlike 99.9% of every other recommendation website out there. To me, that’s pretty refreshing – not to mention rare. But, I applaud their efforts and approach to build a service that is totally for the end-user. Along with the recommendation side of the site, Cinch also offers users the ability to have their bills analyzed to ensure they are getting the best possible deal available. Again, all of this is free of charge AND they aren’t taking any payment from companies for any recommendations they may make. 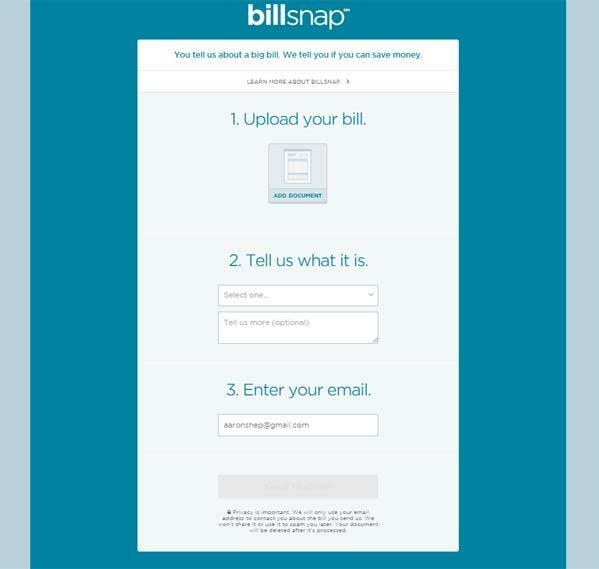 It’s called BillSnap – and I decided to give it a try with our auto insurance. I have always thought we were getting a pretty good deal with our provider – Nationwide. After entering my declaration document from Nationwide, I easily uploaded it to BillSnap, entered my email and within a couple hours got an email back saying that I could be saving $560 by switching to Geico. While that sounded great – I’d need to do my diligence and actually talk with a representative at Geico to see if that were possible (which, I don’t doubt is feasible). No doubt there are countless recommendation-type websites out there for you-name-it – including the financial industry. It’s similar to what Consumer Reports tries to do, weighing the pros/cons of all products and scoring them on their merits based on a pre-determined set of criteria. I think it’s a novel approach – and hope the best for them. This post was brought to you by the fine folks at Cinch Financial. All opinions expressed are our own. Nest Thermostat Review – Can It Really Save You Money? I just tried cinch to get a bank recommendation for a primary checking account. its recommendations were terrible. 2. that the website is dated and hard to use even though i ranked online bill pay high on my list of priorities. Its second recommendation was Bank of America. This is a reasonable recommendation given my priorities, however in its list of reasons why this bank is NOT a good choice for me it says “This bank doesn’t have many free ATMs nationwide.”. Elsewhere in the list it says “There are many free ATMs that accept remote cash deposits nationside.” This seems contradictory. In conclusion, i’m not going to use this website for recommendations for something important like my personal finances when it doesn’t seem to have all the kinks worked out. Hi RL – Thanks for your comments. I think Cinch is still a work-in-progress, but I know they appreciate the feedback as they are working to improve its recommendations. I’d also give BillSnap a try.